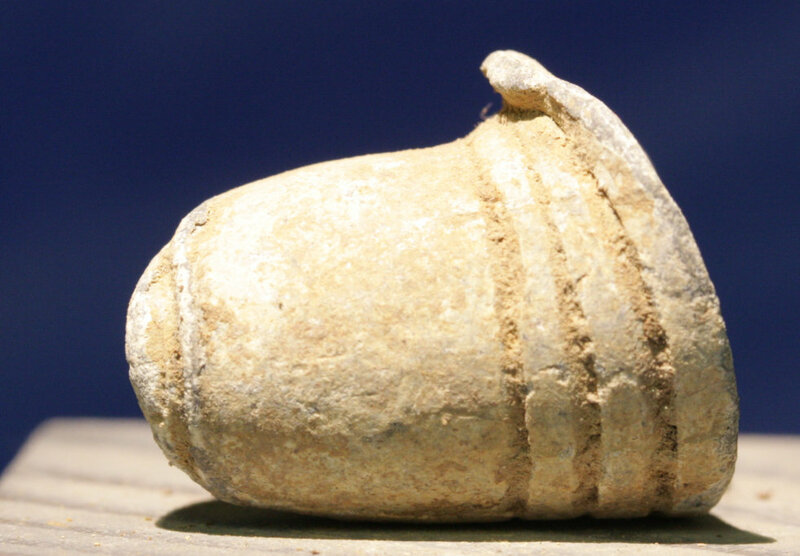 This fired bullet, which has a ram rod mark on its nose and appears to have tumbled in flight and struck rear first, was found at Devil's Den in the area between the now famous battlefield landmark and Big Round Top. This artifact was a part of the collection of Iva Rosensteel, sister of George Rosensteel (founder of the Gettysburg National Museum and the famous Electric Map) so the provenance could not be better. This is the first time that this artifact is being offered for public sale and I feel very privileged in the opportunity to offer it. The Rosensteels were, of course, the most famous artifact collecting family in Gettysburg and the bulk of the relics on display at today's Gettysburg National Park Visitor Center come from the Rosensteels. A signed provenance letter will be provided with this relic.